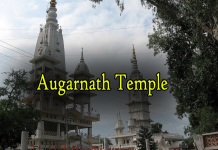 The famous Veerabhadra temple that dates back to 1583, and is dedicated to Veerabhadra, is located here. It was built by the brothers Viranna and Virupanna. And, this temple is one of the most notable examples of the Vijayanagar architectural style. Also, it is famous for its sculptures. These were created by the artisans of Vijayanagara empire. Also, it has idols of Ganesha, Nandi, Veerabhadra, Shiva, Bhadrakali, Vishnu and Lakshmi. 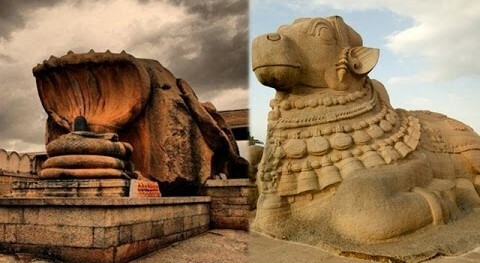 A huge Nandi bull made out of a single granite stone is one of the major attractions near the main Lepakshi temple. And, the place is renowned for being one of the best repository of mural paintings of the Vijayanagar Kings. Many old Kannada inscriptions dating back centuries can be seen on its walls.The main temple at Lepakshi, the Veerabhadra Swamy temple is functional, and pujas and other sacred rituals are practiced every day. 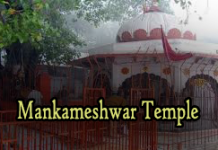 Inside, there are shrines of Veerabhadra swamy, Shiva, Vishnu, Durga and other Hindu gods. Darshan Timings:- 5 AM to 12:30 PM, 4 PM to 8:30 PM. The darshan for the devotees is open all days a week. Timings are subjected to change during festivals, important rituals and during grahan (solar and lunar eclipse). The first puja is dedicated to the Shivalinga and then to Lord Veerabhadra. During morning hours, the lord appears as Bala rupa (youth) and as a hero in a moustache in evening hours. Devotees perform Abhishek to Lord and Mother and offer vastras. They also offer sweet pudding – sarkarai pongal nivedhana. As in Lord Vishnu temples, here too Sadari blessing with the lotus feet of the Lord is offered to devotees. Betel leaf is the prasad in the temple.